Julius Kambarage Nyerere (April 13, 1922 - October 14, 1999) was President of Tanzania (previously Tanganyika), from the country's founding in 1964, until his retirement in 1985. Born in Tanganyika to a local Zanaki chief called Nyerere Burito, Julius Nyerere was known by the Swahili name Mwalimu, or "teacher," because of his profession before becoming active in politics. Nyerere was the first African head of state to retire voluntarily. He stepped down because he realized that his socialist policies of communal ownership of farms and state ownership of services were not working. Under his Presidency, Tanzania slipped from being the largest exporter of food in Africa to the biggest importer of food. However, he made no attempt to cling to power or to influence his successors, who restored capitalism. Nyerere had wanted to make Tanzania self-reliant, free from indebtedness to former colonial powers or to the West. Like other leaders of former colonies, he saw colonialism and capitalism as responsible for the subjugation of their people. A devout Catholic, Nyerere often fasted and did not enrich himself at his nation's expense. His preferred dress, a Mao tunic, contrasted with the flamboyant uniforms worn by some of his contemporary heads of African states. While his policies may have proved disastrous for his country, few question his sincerity. Tanzania remains one of the poorest countries in the world, but its economy has grown since Nyerere's retirement, reaching 6 percent during 2006. While his economic policies are acknowledged as having failed, other policies succeeded. For example, under Nyerere literacy and health care "surpassed anything most African countries had achieved," thus, his legacy has been described as "rich and varied" and his intentions as always "noble." He also battled the International Monetary Fund over the issue of Third World debt, and created "a genuine national entity out of a hotch-potch of some 120 ethnic groups" which some consider to be his most "enduring achievement." Even after the failure of his socialist experiment, he retained, says a Guardian obituary, his "worldwide moral authority." Nyerere began attending Government Primary School, in Musoma, at the age of 12, where he completed the four-year program in three years and went on to Tabora Boys Government Secondary School. He received a scholarship to attend Makerere University (at that time it was the only tertiary education institution in East Africa), where he obtained a teaching diploma. He returned to Tanganyika and worked for three years at St. Mary’s Secondary School in Tabora, where he taught biology and English. In 1949, he got a scholarship to attend the University of Edinburgh (he was the first Tanzanian to study at a British university and only the second to gain a university degree outside Africa) where he obtained his Masters of Arts degree on economics and history in 1952. In Edinburgh, partly through his encounter with Fabian thinking, Nyerere began to develop his particular vision of connecting socialism with African communal living. On his return to Tanganyika, Nyerere took a position teaching History, English, and Kiswahili at St. Francis’ College, near Dar es Salaam. It is at St. Francis’ College that he founded TANU. His political activities attracted the attention of the colonial authorities, and he was forced to make a choice between his political activities and teaching. He was reported as saying that he "was a schoolmaster by choice and a politician by accident." He resigned and continued with his work on his goal to bring a number of different nationalist factions into one grouping, which was achieved in 1954. Nyerere traveled throughout the country, speaking to common people and tribal chiefs, trying to garner support for the movement towards independence. He also spoke on behalf of TANU to the Trusteeship Council and Fourth Committee of the United Nations, in New York. His oratory skills and integrity helped Nyerere achieve TANU's goal for an independent country without war or bloodshed. The cooperative British governor Sir Richard Turnbull was also a factor in the struggle for independence. Nyerere entered the Colonial Legislative council in 1958, and was elected chief minister in 1960. In 1961, Tanganyika was granted self-governance and Nyerere became its first Prime Minister on December 9, 1961. A year later, Nyerere was elected President of Tanganyika when it became a Republic. Nyerere was instrumental in the union between the islands of Zanzibar and the mainland Tanganyika to form Tanzania, after a 1964 coup in Zanzibar toppled Jamshid bin Abdullah, who was the Sultan of Zanzibar. 1977-1990 Chairman of Chama Cha Mapinduzi which was formed by a merger between TANU and the Afro-Shiraz Party of Zanzibar. CCM was born in Zanzibar on February 5, 1977. When in power, Nyerere implemented a socialist economic program (announced in the Arusha Declaration), establishing close ties with the China, and also introduced a policy of collectivization in the country's agricultural system, known as Ujamaa, or "familyhood." Nyerere believed that people truly become "persons" within community—starting with the family, then moving into an extended family, and from there into the wider community. Small scale village industry, similar to M. K. Gandhi's model, was ideal for Africa. Influenced by the Mahatma, Nyerere was awarded the Gandhi Peace Prize in 1995. Personhood leads to service to the community. Wealth would thus spread horizontally, not vertically. Although some of his policies can be characterized as socialist, many regard that Nyerere was first and foremost an African, and secondly a socialist. He was what is often called an African socialist. Nyerere had tremendous faith in rural African people and their traditional values and ways of life. He believed that life should be structured around the ujamaa, or extended family found in traditional Africa. He believed that in these traditional villages, the state of ujamaa had existed before the arrival of imperialists. All that needed to be done was to return to this state and capitalism would be forgotten. He believed that this would be a true repudiation of capitalism, since his society would not rely on capitalism for its existence. This ujamaa system failed to boost agricultural output and by 1976, the end of the forced collectivization program, Tanzania went from the largest exporter of agricultural products in Africa to the largest importer of agricultural products in Africa. With the realization that the Tanzanian economy did not flourish, and being unwilling to lead Tanzania using an economic model he did not believe in, Nyerere willingly announced that he would retire after presidential elections in 1985, leaving the country to enter its free market era under the leadership of Ali Hassan Mwinyi. Nyerere was one of the African Leaders during the Pan-African movement that swept the continent in the 1960s. He was a larger-than-life person, a seemingly incorruptible individual and a committed Pan-africanist. Nyerere was also one of the founders of the Organization of African Unity in 1963. Nyerere provided a home for a number of African liberation movements including the African National Congress (ANC) and the Pan African Congress (PAC) of South Africa, FRELIMO when it sought to overthrow Portuguese rule in Mozambique, and ZANLA (and Robert Mugabe) in its struggle to unseat the white regime in Southern Rhodesia (now Zimbabwe). From the mid-1970s, along with President Kenneth Kaunda of Zambia, he was an instigator and leader of the "Front Line States," which provided uncompromising support for the campaign for Black Majority Rule in South Africa. In 1979, he led Tanzania into war against Uganda, then under the dictatorship of Idi Amin, resulting in the defeat of Uganda and exile of Amin. However, Nyerere also instigated the 1977 coup d'etat that ousted the first president of the Seychelles, James Mancham, and replaced him with socialist France-Albert René, a move regarded to have set back development in the Seychelles for many years. After the Presidency, Nyerere remained the Chairman of CCM until 1990, when Ali Hassan Mwinyi took over. Nyerere remained vocal about the extent of corruption and corrupt officials during the Ali Hassan Mwinyi administration. He also blocked Jakaya Kikwete's nomination for the presidency, citing that he was too young to run a country. Nyerere was instrumental in getting Benjamin Mkapa elected (Mkapa had been Minister of Foreign Affairs for a time during Nyerere's administration). In January 2005, the Catholic diocese of Musoma opened a cause for the beatification of Julius Nyerere. Nyerere was a devout Catholic who attended Mass daily throughout his public life and was known for fasting frequently. The African Union, formerly the Organization of African Unity, which Nyerere was largely responsible for establishing, is increasingly taking on an important role in stabilizing the region, in peacekeeping and peace-building in collaboration with the United Nations. Nyerere's example of voluntary retirement from power has set a standard that few African heads of state have yet met. His strong opposition to Idi Amin's dictatorial regime in Uganda and his 1979 invasion, in retaliation for Amin's 1978 incursion into Tanzania, toppled the dictator to popular acclaim, setting an example of Africa policing Africa. In retirement, he continued to work for African unity and also to resolve conflicts, including the civil war in Burundi and to find ways of lessening the rich-poor gap between the developed and developing nations of the world, chairing the South Commission. Despite the failure of his economic policies, he remained convinced that socialism was the right direction for poor countries to take. His modest lifestyle added to his moral authority. He was untainted by scandal or by charges of corruption. Family was central to his concerns. He married Maria Magige in 1953. They had five sons and two daughters. In addition to political writings, he translated two Shakespearean plays into Swahili. Freedom and Socialism. A Selection from Writings & Speeches, 1965-1967, Dar es Salaam: NY: Oxford University Press, 1968. ISBN 9780196440606. Freedom & Development, Uhuru Na Maendeleo. Dar es Salaam: Oxford University Press, 1974. ISBN 9780195197723. Ujamaa—Essays on Socialism. Hki: Suomi-Tansania seura, 1980. ISBN 9789519927732. Crusade for Liberation. Dar es Salaam: Oxford University Press, 1979. ISBN 9780195724622. Julius Kaisari. (a Swahili translation of William Shakespeare's play, Julius Caesar) Dar es Salaam: Oxford University Press, 1969. Mabepari wa Venisi (a Swahili translation of William Shakespeare's play, The Merchant of Venice) Dar es Salaam: Oxford University Press, 1969. ↑ CIA World Factbook, Tanzania. Retrieved May 18, 2007. ↑ Gitau Warigi, Nyerere's Legacy is Everlasting. Retrieved May 18, 2007. ↑ Julian Marshall, Julius Nyerere. Retrieved May 18, 2007. Amin, Mohamed, Annie Smyth, and Adam Seftel. Tanzania: The Story of Julius Nyerere Through the Pages of Drum. Dar es Salaam, Tanzania: Mkuki na Nyota Publishers, 1998. ISBN 9789976973525. Hatch, John Charles. Two African Statesmen: Kaunda of Zambia and Nyerere of Tanzania. Chicago: Regnery, 1976. ISBN 9780809284054. 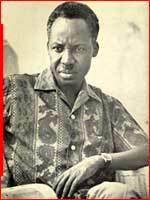 Maillu, David G. Julius Nyerere: Father of Ujamaa. Nairobi: Sasa Sema Publications, 2005. ISBN 9789966951328. McDonald, David A., and Eunice Njeri Sahle. The Legacies of Julius Nyerere: Influences on Development Discourse and Practice in Africa. Trenton, NJ: Africa World Press, 2006. ISBN 9780865438811. Smith, William Edgett. We Must Run While They Walk; A Portrait of Africa's Julius Nyerere. New York: Random House, 1972. ISBN 9780394467528. Yakan, Mohamad. An Almanac of African Peoples & Nations. New Brusnwick, NJ: Transaction Publishers, 1999. ISBN 1-56000-433-9. Retrieved May 18, 2007.Retrieved May 18, 2007. This page was last modified on 14 June 2018, at 18:51.